I like every place I find myself in. Sometimes I like it so much I love it. Both of my children are getting married this summer, my daughter and my son. Since I'm hosting the rehearsal dinner for my son, my future daughter-in-law and I have been scouting locations. And my daughter, who also needs a spot for her rehearsal dinner, has come along a couple of times, too. We've looked at fancy, foofy bed and breakfasts, a refurbished school which is now a restaurant, a couple of funky bar-type places. The idea is to find a place that reflects the vibe of the happy couples, which in both cases is casual yet elegant, down home but classy. I love every single place we visit, even if it is clearly unsuitable for the dinner. Love them all. I loved the bed and breakfast, even though the back patio was cramped and awkward and the interior held way too many lace doilies. Loved the refurbished school even though the only room big enough to hold us was dark and dreary. Yesterday we visited the mothership of a local catering firm where they host events. A fire placed in the fireplace, elegant taffeta drapes set off rooms, big windows looked out on the street, whimsical decor elements were placed just so. I fell in love, of course. And started blabbing about how great it all was. My daughter and my daughter-in-law both gave me the stink eye. I could tell they were sending mental messages to stop talking. Stop talking now. But I waxed poetic about how much I loved the space. And, even though these caterers charged extra for every single thing ("The napkins? Extra charge. The flatware? Extra charge…"), in my mind the budget has already flown out the window, and who cares? because I love this place so much it will be worth it. It takes me hours to settle down and realize, ick. To come to my senses and see that the place was not appropriate at all. That all those extra charges will bankrupt us. And finally, as I was ever-so-slowly realizing these things, I figured out why this always happens to me. Why I always fall in love with wherever I am. Blame it on my writer's imagination. When I was at the catering space yesterday, it wasn't just the place itself, it was what I instantly imagine happening there that makes me fall for it. I saw the buffet table in the front room laden with food, a man dressed in a suit holding a cocktail brush by the tapestry drapes. 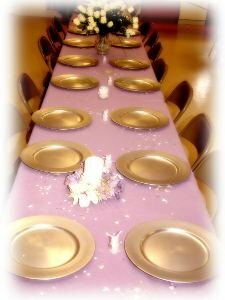 I saw the room set up with round tables, gorgeous table cloths ("Brocade? Extra charge…") and people in fancy dress sitting around it toasting the nuptials to be. And then I think, I'll use this space when I have a book release party. Actually, I'm going to use this space all the time in the future (because suddenly, in my brain, I have the kind of life which requires the constant use of caterers). And then I begin to design the color scheme for the next event we'll have there…. And then my daughters are saying goodbye and pulling me away. And later, much later, I'll fall to earth with a thud. But man, oh man, the flights of fancy sure are fun. It is so great to be a writer. Do any of you do this? Please tell me you get just as carried away as I do. I hasten to add that my grandmother and parents were probably right about the apartment first mentioned. It wasn’t the ideal place and had many things wrong with it. It took me a day or two but I also came down from my imaginative high to realise it wouldn’t have worked. You are not the only one who gets carried away by your imagination. Isn’t this why we have our family members with is? So they can hang on to the string of our helium-filled imaginations? Like Jessica, my writers imagination also got me carried away during house hunting time. I fell in love and imagined myself in every one we looked at, so much so it was starting to cause arguing when my husband (a former realtor)and I would get in the car after a tour and he stated the reasons it wasn’t for us. Jessica, Don’t you think it was perhaps a sign that Apartment 19 fell through after you couldn’t even imagine yourself there? I hope you find a suitable apartment–and one that fires your imagination–soon. Derek, I love your description of happily visualizing yourself in every house you looked at, without the least concern for practicalities. I fear I am too much the same way. Christi, Perhaps you have hit on the perfect solution for those of us who get carried away with our imagination–let someone else make the decision!